This site is inspired by the above quote of author Henry Miller. I believe it to be true. And while it is my pursuit to forget myself in publishing this blog I do so acknowledging that it can be a selfish pursuit. It is in the process of forgetting oneself, which makes the world become larger and hopefully better. Just like our relaxed frog reading a book from his coconut shell. If in the process of making my world a bit bigger, a bit brighter and a bit bolder, I can provide some entertainment and information to those that seek it, more people benefit from having a literary culture. Noir is a genre to be enjoyed in books, art, photography, film and at times as a spectator sport. It is an existence that need not be a desired long term destination. I enjoy the fictional world of noir while acknowledging that the real noir world exists. Please let me know the people, things, literature and music that interest you in the real world, if you are so inclined. Particularly those that have left a footprint in Thailand and South East Asia. You can Email me at ThailandFootprint@Gmail.com. About me: a paralegal by profession, an internet business owner, a basketball junkie, a husband, a step-father of a grown son and daughter, a brother, an Uncle, a proud chihuahua owner, a traveler, a reader, an appreciator of life, a lifelong learner, a laugh-er, a moment collector, a fast talker and a slow walker. I think most people are pretty amazing if you give them a chance and if you are gracious toward them the chances increase. I have split my last thirteen years between Thailand and Santa Cruz, CA; a beach community in Northern California. I have made many mistakes during my time on the planet, some of which I even learned from. More good luck than bad luck has come my way – I take some of the credit for the good, almost all of the responsibility for the bad. In the long run, John Maynard Keynes is going to be right. Disclaimer: Most disclaimers are not worth much. If I have to take the time to enforce my disclaimer, I have clearly lost the plot as to why I started this blog in the first place. Having said that, do the right thing, do no harm. You may re-blog any and all posts, written by me, at any time for a not for profit basis. This stuff is copyrighted and intellectual property, believe it or not – with or without the legalese. Have a great day. I am from California. We still say that – sometimes. It’s 2019, now, after all. If you enjoy this blog, Different Drummers: Bangkok Beat Redux with over 50 noir poems by John Gartland is available at all the usual outlets. You may enjoy it as well. Thanks for stopping by. Thanks, Collin. I was able to nab your artist when Dr. Siri needed a nap. That helped the design a lot. I bought, The Book of Answers today. Easy Street should now be within reach. Cheers. This is one of the best “About” pages I’ve ever read. Your About Me – quite interesting. “I have made many mistakes during my time on the planet, some of which I even learned from. More good luck than bad luck has come my way – I take some of the credit for the good, almost all of the responsibility for the bad.” Awesome. I come from another Asian country. Thailand may be more progressive economically now than the Philippines but there aren’t that many differences. Glad to meet you, Kevin. Thanks, Lady from Manila. I’m tempted to say that’s the best comment, ever. But I wouldn’t be forgetting myself, if I did that. It’s a lot harder than it sounds. Glad to meet you in WordPress land as well. I like your blog. Our son is from Thailand. While here he has become a basketball fanatic. I’m tall (6’8″) but he’s good. Great blog. Nice to meet you. I am working on my own introduction in my new blog and yours is inspiring. I see we both love Henry Miller. Cheers! And thank you for reblogging my post. It feels good when your just starting. Regards! Just discovered you and love your philosophy. I was born in rural Thailand yonks back and grew as the only farang kid in the village. The love affair has never really ended. Starting out on my new blog in trepidation. Thanks. I just looked st your blog, Thai Village. Very nice. Thanks for your comment. I look forward to reading more in Thai Village when I return to BKK. Currently in Laos. I’ve been looking around your blog, and I think you offer a lot of great information and insight, and exposure to noteworthy people and ideas. Great attitude throughout, as well. I wanted to leave a comment because I too live in Thailand, and I attended UC Santa Cruz for my bachelor’s. Two great places to live! Thanks, Lindsey. I’ll be meeting a Banana Slug grad this week, for lunch. I hope you were able to find the two posts about Muay Ying, Melissa Ray. They are among my personal favorites. Hi Kevin, I really enjoyed this read. I would like to write to Chad Evans and ask him about some things in Frontier Theatre. I am composing music for a show. if you can pass on my email to him, I would greatly appreciate it. Lawrence, I’d suggest you contact Chad via Facebook. He goes by Cead Evans, Adelaide, Australia. Good luck and thanks for the note. I have split the last eighteen years between Thailand and a small beach community in Northern California. I like to read. I like to creatively consume. Here I display a great deal about the artists, poets, novelists, musicians, photographers and the occasional muse who create in Thailand and SEA. 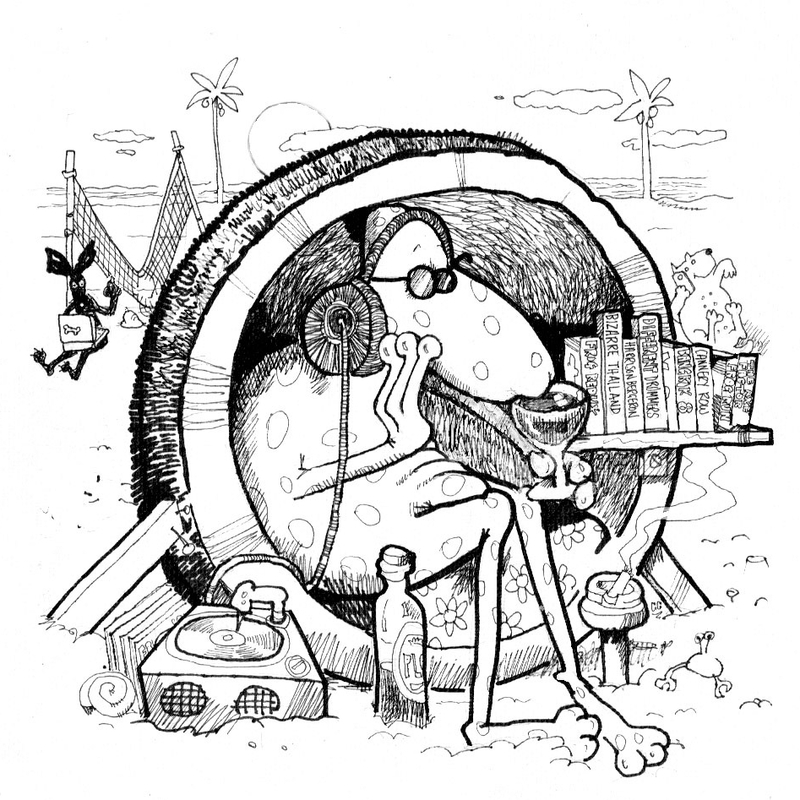 Gob, the very cool and relaxed frog in the coconut shell was drawn by the very talented, cool and relaxed author / cartoonist, Colin Cotterill, to whom I am very grateful. I am, among other things, a blogger who has been published a few places thanks to the kindness of others. I am the author of Bangkok Beat, and in 2019 DIfferent Drummers, both published by Frog in the Mirror Press and on sale now as a paperback and eBook at Amazon, Barnes & Noble, Kobo and Apple iBooks among others. In the long run, John Maynard Keynes is going to be right. Happy reading.